Did you know you can give yourself an automatic $2 discount every time you go out to eat? Well, you can, and you’ll probably stay healthier as a bonus. All you have to do is order a glass of ice water with your meal instead of soda or tea! Non-alcoholic drinks cost around $2 in most restaurants, so asking for water instead will save you $2 on every restaurant meal you eat. And if you drink water instead of an alcoholic beverage you could easily save at least twice that amount! Even better, you can save a bundle if your entire family opts for ice water instead of their usual preferred beverage. For example, a family of 4 would automatically save $8 per meal! If your family of 4 eats out twice per week, the $8 you save every time will add up to a whopping $832 in savings, each and every year. Imagine what you and your family could do with that extra money! On top of the monetary savings, water is also a lot healthier than virtually any other drink you could order. That means over time your health care costs will probably be lower too (and you just might end up with a smaller waistline)! Of course not everyone likes the taste of water, but there’s an easy and cheap way around that too. Simply take a small single-serving tube of your favorite flavored water powder to the restaurant with you, then pour it into your water glass and stir. While it’s true that you won’t save the entire $2 that you would otherwise pay for a drink, you’ll get your drink for a few cents instead of a couple of bucks. Bottom line: Water is just about the healthiest thing you can drink, and ordering it along with your restaurant meals can save you a bundle of cash over time. 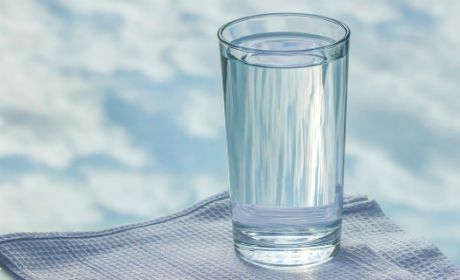 Bonus tip: The short video below explains why we should all probably be drinking more water than we currently drink. Note: As always, you can watch the video at full screen by clicking the “square” icon in the lower right-hand corner of the video. ﻿ By the way, I started drinking ice water with virtually every meal about a year ago, and I’ve never felt better!